The US Postal Service 4-cent Lincoln coil stamp and associated first day covers were issued at the Mandan post office on July 31, 1958. The "4-cent Lincoln," as the name implies, features President Abraham Lincoln. This stamp was issued to accommodate the August 1, 1958 increase in first-class postage rate after twenty-six years at three cents. Originally issue on November 16, 1954, this red-violet stamp features Lincoln’s likeness inspired by a portrait by Douglas Volk. First-class postage remained four cents through January 6, 1963, and this stamp was the workhorse during that period. The new Lincoln stamp replaced the three-cent purple "Statue of Liberty-In God We Trust" stamp which previously filled the role. A "First Day Cover" (FDC) features unique artwork known as cachets applied to envelopes affixed with the new postage stamp but only on the date of first of issue and only the select post office(s). 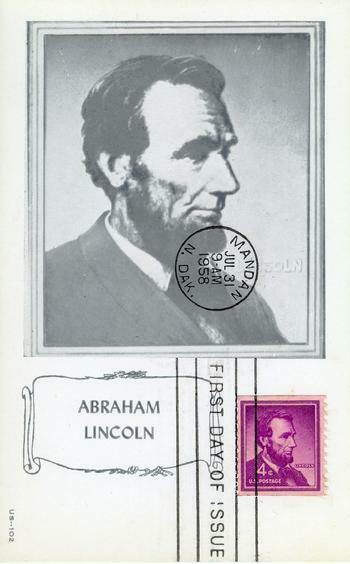 The FDCs for the roll coil stamps were issued at the Mandan post office, which had been singled out for the honor due to its proximity of Fort Abraham Lincoln. FDCs for the stamp in booklet panes were issued on the same date at Wheeling, West Virginia. Abraham Lincoln currently ranks third as the subject of a US postage stamp. Only George Washington and Thomas Jefferson have appeared on more stamp issues. These postage FDCs are collected nationally. Sixteen first day cover cachets as well as a blank envelope cancelled on that date are presented above. Mrs. Margaret (George H.) Bingenheimer, Mrs. Fanny (John L.) Bowers and Mrs. Anne (Lyman N.) Cary, all early Mandan pioneers and wives of early day prominent businessmen, were given the honor of purchasing the first new four-cent Lincoln coil stamp. In the weeks before the release, over 100,000 letters were received by the Mandan Post Office for first day cancellations. According to Mandan postmaster J. J. Murray, more than $60,000 (over $450,000 in 2010 adjusted for interest) worth of the new 500-stamp rolls were on hand for the first day of its release. In addition to the 100,000 letters, 50,000 envelopes were cancelled for stamp dealers across the country and around the world. First day cachets were affixed to envelopes from France, Australia and the Philippines. The permenant staff was supplemented with 18 temporary workers to assist with the first day issues.